At £572.60, average weekly expenditure (all costs, adjusted for inflation) per household in the UK is at it its highest level since the financial year 2004–2005, according to data published in January 2019 by the Office for National Statistics. 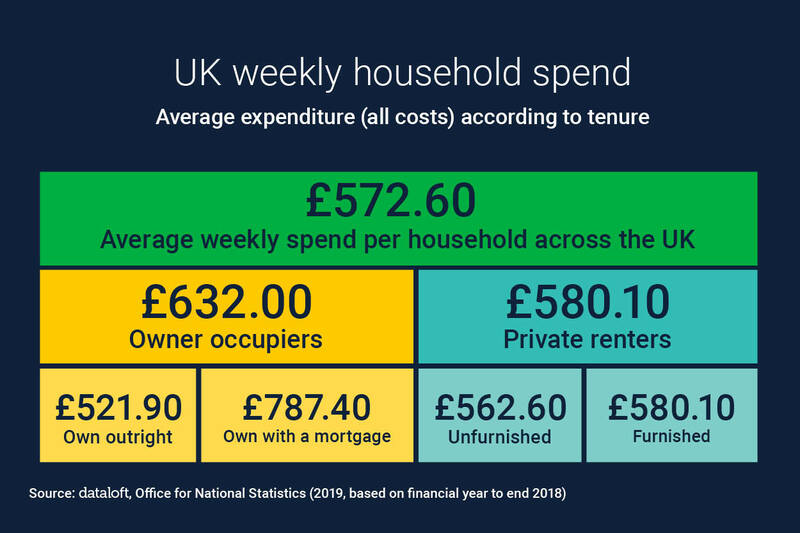 At £632.00 per week, households in owner occupation spend on average £52 more per week than those in the private rented sector at £580.10. Across the UK, the average weekly amount spent on a mortgage is £159.60, equivalent to 27% of total weekly expenditure. 44% of weekly mortgage costs are attributed to interest payments. For those in the private rented sector, rental costs account for 26% of weekly expenditure. Across London and Wales, the average spend on rent per week is higher than the average spent on a mortgage. In all but four regions, the differential is less than £20 per week. For more on average weekly spend on housing per household, by region, see the above article.